Description: Rose Campbell is the only girl in a family full of boys. Recently orphaned she arrives at "Aunt Hill" to wait for her new guardian, the mysterious Uncle Alec who she has never met. When he arrives, he turns her whole life on it's head by insisting that she run about and even play with those horrid boys. But Rose quickly discovers boys aren't quite so bad. Friendships develop, adventures occur and much fun is had by all. Why I Picked This Book: This one of my absolute favorite books as a child so I was curious to reread it as an adult. My Impression: I don't remember where or when I got my copy of Eight Cousins though I remember what it looked like. It was a regular paperback size though the paper was really thin for some reason and the binding only held up for the first 100 reads or so. And read it I did! While I had never really connected with Little Women (the whole Laurie/Amy/Jo thing never sat well with me but that's another review) I instantly was caught up in Rose's adventures. I loved the idea of the old houses full of nooks and crannies and brimming with treasures brought home by generations of sea captains. Rose with golden curls and leanings towards vanity and impatience was a girl who was easy to like and how could I not enjoy the mischief caused by the hoard of cousins. When I was thinking of books for my Classics Club list Eight Cousins came up as one I really wanted to reread especially since I had reread and very much enjoyed The Secret Garden, another childhood favorite, a few months before. I'm not sure Eight Cousins holds up quite as well as The Secret Garden. As is typical for the time the story is incredibly virtuous. In this case it's a bit on the side of tooth-achingly wholesome and the "Clan" is a little on the overly perfect side. There's not a huge amount of character development though I did love what there was. Seeing Rose come out of her shell and watching her friendship with Phebe was really lovely and I liked seeing her interact with the boys - especially with Mac. The imagery of the warehouses and the trunks full of treasures is wonderful and I would dearly love to see a fireworks show like the one described early in the book. While I didn't enjoy this as much in adulthood as I did as a child I can see what drew me to the book. Would I Read More of this Series/Author? : I will. I want to reread it's sequel Rose in Bloom as I didn't enjoy it nearly as much as a child but I think I would like it better now. I'm also looking forward to rereading Little Women. Would I Recommend this Book? : I'm not sure anyone who didn't already have a connection to this one would be blown away. 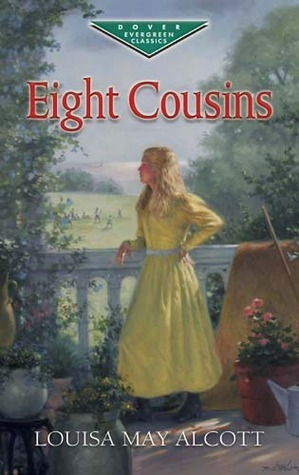 I recently downloaded Eight Cousins, as I remember enjoying it so much in childhood, along with the other Alcott books. This is one (along with Rose in Bloom) that I haven't reread in adulthood, so I am eager to see how it stands up to my childhood memories of it. I would love to have a print copy, with the old fashioned cover. I would love a print copy as well! I have a copy of Little Women that has beautiful illustrations and I'd love to find one like that of Eight Cousins. I've been thinking about going back and rereading a few of my favourite childhood reads. The one I remember rereading every week was The Naughtiest Girl bind-up. I remember bits of it, but I'm also a little scared to read it now and than taint my childhood experience. It's a toss-up. I haven't read Little Women(that I remember). But it's one I keep meaning to. I should read it and than we can compare notes. I know it's well loved but I also don't know if it will be one I like. We'll see. Oh we should! I'm hoping to reread Little Women at some point though my memory of the original reading isn't quite clear. I know what you mean about not wanting to taint childhood favorites! So far I've been lucky but I'm always nervous! It was very nice to reread it even though I didn't love it the same way I did as child. Now that I think about it I'm not sure where most of my books from. I know I spent a lot of time at the library and there always seemed to be books from somewhere! Was looking forward to your review. I haven't read this since I was a little girl, but I remember it fondly. Funny how our memory can often be better than the adult actuality. It was interesting to read it as an adult as I had such a different view. I sympathize far more with Uncle Alec than I do with Rose this go round! Even though I didn't love it quite as much as I did as a child it was still nice to visit my old friends! I listened to The Great Gatsby not too long ago and enjoyed it so much it's made me want to revisit the books I enjoyed - including Jane Eyre. I'm hoping to do a reread of Little Women as well! Eight Cousins was probably my favorite LMA book as a child, and I still re-read it occasionally. I agree that it's a bit more "sweetsy" than The Secret Garden, but as an only child with a lot of cousins, I could certainly relate to Rose! As I got older, I started to prefer A Rose in Bloom, in part because of the romance and a bit more character development. But I still enjoy them both! Good review as always, Katherine! I never even heard of this until recently but this sounds good, despite the heavy emphasis in virtue. I may see if my library has it. I didn't read this as a child and DNF'd it as an adult. I think I should give it another go though. I ADORE Little Women. There are a few books from my youth I hope to revisit at some point. I do worry they won't hold up. Like Girl of the Limberlost. I never read this one nor anything by the author, actually. Not even Little Women.